I recently organised a tasting billed as ‘The Ultimate Australia Evening’. Before the knives come out, what was included, and what was not, was never meant to be definitively ‘the best’. The starting point was Langton’s guide, the mostly widely regarded benchmark of Australia’s top wines, but simple pragmatism was a crucial element too: when you set up an event featuring very expensive wines in a swanky London venue, you cannot risk not attracting enough paying customers, so big ticket items like Grange and Hill of Grace were more or less essential in the mix. 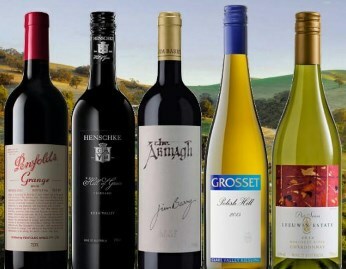 The wines were not meant to represent all Australian regions, nor all of Australia’s wine styles. More importantly, we featured well-established big names, not the cutting edge of the artisan Australian scene (which is thriving). But the wines were undeniably from the top echelons of established producers. The sell-out crowd was a mix of die-hard Australian wine fans keen for an update on wines they already knew, and wine lovers less familiar with Australia but curious to see what was on offer. It’s fair to say the first wine – Jeffrey Grosset’s 2015 Polish Hill Riesling – was like an electric shock to some around the room. Those unfamiliar with the intensity of top Clare Valley dry Riesling really didn’t know what to make of it, whilst others talked of the “nerve,” the “energy,” the “obvious future potential.” The 2009 went down a lot more smoothly in all senses of the word, and it was a perfect example of how this wine transforms with age. Leeuwin Estate was represented by two vintages of the Art Series Chardonnay, 2012 and 2008. Both wines drank beautifully, again showing how nicely the wine ages, but also how winemaking approaches must be adapted in terms of picking dates, barrel use, and other factors, in light of different vintage conditions. Onto the reds, including three top examples from the 2010 vintage. Jim Barry’s ‘The Armagh’ was shown in the 2010 and 2006 vintages, the super-ripe and in some ways ‘classic’ large-scaled 2010, and the nicely maturing, polished 2006. Henschke was represented by Hill of Grace 2010 – narrowly voted wine of the night by the tasters present – and the alluringly aromatic Johann’s Garden 2014. Finally, Grange 2010 and Bin 389 from 2012 represented Penfolds. The contrast between the single-vineyard Hill of Grace, so aromatically expressive of its vintage, and the brooding, deep purity of the multi-district Grange prompted a lot of debate. (2017) There’s 4% Cabernet Sauvignon joining the Shiraz, in a wine that spent 17 months in new American oak hogsheads. Fruit came from across South Australia as always. Fabulous concentration, mind-boggling intensity, so many layers packed into this, chocolate and liquorice, coffee and balsamic, meat-stock notes and serious black fruit at the core of it. Very tightly wound at present and unlike the Hill of Grace 2010 it would be criminal to drink this now: it’s a massive Grange of power, concentration and great purity, and will require many years in the cellar to show at its best – and age for 20 years at least. (2017) Aged 14 months in new oak, 80% French and 20% American. Big, super-ripe, even slightly raisiny, pruney aromas, but Amarone-like rather than being stewed or baked: cloves and spices too. Terrific energy and real freshness on the palate, an electrical charge of power, all the time the solid fruit at the core and a grippy finish. Very good - big, but fleet of foot. Should cellar well for a decade. (2017) Creamy, dense, blue/black fruit, intense blueberry and damson plum spectrum. Tight and polished on the palate, there’s a liquoricy core, which gives this lots of grip, lots of length, and given the alcohol remarkably fresh – though not so fresh as the 2010, the 17 months in French and American oak also a little more evident. (2017) A blend of 70% Grenache and 24% Mataro with 6% Shiraz, aged in large barrels. What beautiful ripe fruit, bursting with blueberry and super-ripe, deep mulberry, then fleshy and ripe, spicy, but so alive with slightly meaty, balsamic notes. In the mouth, it is savoury to the nth degree, with polished tannins and perfect balance. Impressive. Blooming good value from this garden for a wine of such quality. (2017) The blend is 54% Cabernet Sauvignon and 46% Shiraz in the wine known as ‘baby Grange’ because it is aged in ex-Grange barrels – 12 months in American oak hogsheads. Cedary, quite pruney at first, curranty, but again crucially not ‘dead fruit’ – super ripe, not overripe. Tight and creamy on the palate, filled with sweet but tangy cassis, excellent concentration and so tightly focused by its acidity and fine tannin framework. Will cellar 10 years. (2017) Wonderfully developed nose, with loads of toastiness, minerals with that touch of petrol/paraffin, and a lightly earthy character all joining the limey fruit. In the mouth, beautifully honed, river stone minerals and salts and endlessly long. Fabulous and probably still capable of another 10 years of cellaring: these wines really do need age. (2017) Obviously a broader fruit spectrum following the shock of two Grosset Rieslings, a layer of cashew and almond too over ripe pear. Mouth-filling, long and poised, there is plenty of ripe fruit, but it stays on the pear and stone fruit spectrum, elegantly framed by its acidity and the gentle creaminess of the oak. (2017) More developed toast and nuttiness than the 2012, cashew again, lime and hints of more tropical fruit. Great concentration on the palate, such a tight, intense thrust of lime acidity and burst of orange-bright fruit, again just touching on more tropical, guava-like notes, but the tension of the acidity reins that in beautifully. (2017) It's fair to say that some of the tasters hadn't experienced top-level Clare Riesling before, and this baby Polish Hill delivered a great shock of electrically-charged lime and a little petrolly minerality that took some by surprise. The palate is so intense, riven by its citrus and tight apple fruit and that massive concentration of acidity. Needs five years or more to really sing, when its score may well notch up a point or two.